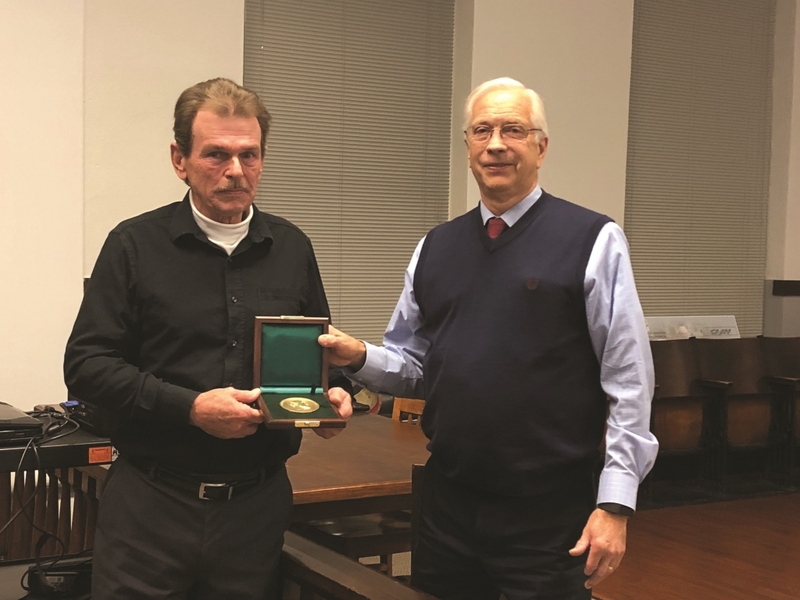 Carnegie Hero Michael Eugene Chestnut, left, receiving the Carnegie Medal from Bracken County (Ky.) Judge-Executive Earl Bush at the county’s board meeting on Nov. 28 at the Old Courthouse in Brooksville, Ky. Chestnut, then 59, of Foster, Ky., rescued three teens from a burning, overturned vehicle after it crashed head-on into a van on a rural road in Foster in August, 2017. Chestnut crawled into the overturned car twice and removed all three teens to safety, including one teen who was nearly 100 pounds heavier and 1 foot taller than Chestnut. Photo by Christy Hooks, The Ledger Independent.